Sorry for the delay kids, I went to the wrong place. Time for some more Sprecher. Remember Sprecher Orange Dream? Nope? Then you're not a true fan of "TSJ." Real fans may proceed. 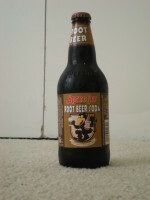 As you recall, their Orange beverage was pretty tasty, so this time we have Sprecher Root Beer Soda. Not root beer, root beer soda. Either way I haven't done a root beer in a while and figured I would. Wow so this is very, very smooth and quite creamy. I'm downing it pretty quickly, and this is a 16oz. bottle, not one of those 12oz. deals. Very sweet, good flavour. Almost a sweeter A&W. Pretty clean too, not much of a "stickiness" to it. The head on it is ridiculous, if you're one of those people that care about such things. I'd get it again. It was about a buck fifty for one of these bottles. Good bottle too, some crazy looking crow drinking it. Yeah I know we're doing cheap sodas this year but hey, I had to fancy it up a bit for the new site.